Exit J16 onto the A500 and then exit the A500 onto the A50 (towards Uttoxeter). Exit left off the A50 onto Weston Road (A520). Turn left at the second set of lights onto Park Hall Road. Confusingly, our industrial estate doesn't have numbers on buildings. To find Easy Composites drive onto the estate and head stright up the middle towards a building with 'Fowlers' on the side. At Fowlers, follow the road round to the right (over some speed bumps) until you start to come back on yourself. 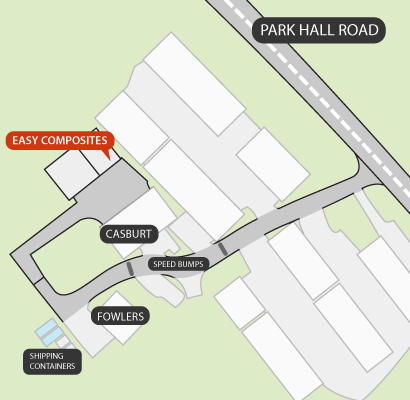 Easy Composites is the end unit on the left hand side.